Anna Maria island is a frequent romantic getaway and honeymoon/anniversary destination for couples with its brilliant sunsets, thrilling ocean activities, wildlife and nature tours, plentiful waterfront and fine dining options, and so much else to explore as a pair. Plan an amazing beach destination wedding on Anna Maria Island, then stay for a fun and relaxing start to happily ever after. Choosing the right romantic 1 bedroom Anna Maria Island vacation rental is important to guarantee that you will have a fun and memorable experience. We have some excellent options to choose from depending on the amenities and location that you prefer and your other requirements. All of these rentals also feature our professional linen service to save you time, help you travel lightly and provide you with the experience of staying in a luxury hotel without the cost! Other standard amenities include wireless internet, flat screen televisions, full kitchens, washer and dryer, updated and modern décor, luxurious beds and bathrooms, close proximity to the beach, and tropical landscaping. Below you’ll find more details on our top 6 romantic Anna Maria island vacation rentals where you can relax on the beach as a couple anytime you wish, have convenient access to amazing restaurants whenever you want to grab a meal, relax in scenic outdoor seating areas with lush landscaping and pools, and have every comfort you could need. 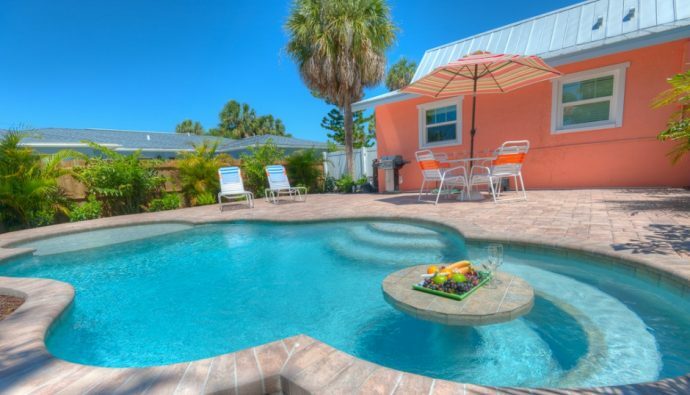 Peacock Way is centrally located in the Holmes Beach community of Anna Maria Island and has many benefits that will make your getaway truly enjoyable. This spacious duplex has been recently renovated and now has bright island themed interior décor, new and comfortable furniture, and a modern design. A perfectly maintained heated outdoor pool is available at this charming lodging choice where you can take a quick dip whenever you feel like it, but the beach is just a 5-minute walk away. Some of the island’s best restaurants are also right next door including Minnie’s Beach Café, Hurricane Hanks, Lobstahs, and eat here Anna Maria. This rental also features professional linen service for its high-quality linens bath and beach towels, just like you would expect at a top hotel, along with a comfortable king sized bed. This allows you to pack lightly and save a substantial amount of time on handling laundry yourself. A full kitchen with stainless steel appliances and everything you could ever need to cook is always available, but you’ll also be able to easily access plentiful dining options on the island with the free trolley or within walking distance! Leave the car at home, pack a few things and reserve this amazing romantic rental now for your next romantic adventure, with all of the benefits of a hotel and home combined! Feel free to view our high-resolution photos of this romantic Anna Maria island vacation rental, and get an immediate price for your upcoming trip right on our website at any time. Shell Haven is steps away from the beach and is ideal for the inner beach bum in all of us. Located on heavenly Holmes Beach, Shell Haven is a lovely one bedroom and one bathroom that offers pristine views for an exceptional pricing during your spring stay. This waterfront condo has been recently renovated top to bottom. Renovations include a fully equipped new kitchen with brand new stainless steel appliances, granite counters, new flat-screen TV in the living room and a charcoal BBQ grill for your enjoyment. Shell Haven is one of our most frequently booked Anna Maria Island romantic beach house rentals, and reserving it will guarantee the getaway of a lifetime, as there’s nothing that can compare to staying right on the beach and being centrally located on Anna Maria Island. Step right outside your rental and grab a few beach chairs, umbrellas and drinks and take in a brilliant sunset without having to make dinner reservations. Walk to highly rated restaurants such as the Beach Bistro and Ginny’s Cafe and take the trolley to other beaches in Holmes Beach and the nearby city of Anna Maria. Experience exciting ocean adventures together including sunset and dolphin watching tours, fishing charters, parasailing, kayaking, eco-tours, and snorkeling. Shell Haven has two sleeping arrangements which include a new queen-sized bed and a full pull-out sleeper sofa. Centrally located on the Island, you are a short walk away from everything Anna Maria Island has to offer. You can jump on a trolley to explore other parts of the Island, so you don’t have to worry about driving. Looking for your own personal paradise on Anna Maria Island? Shell Haven is the ideal spot for that! 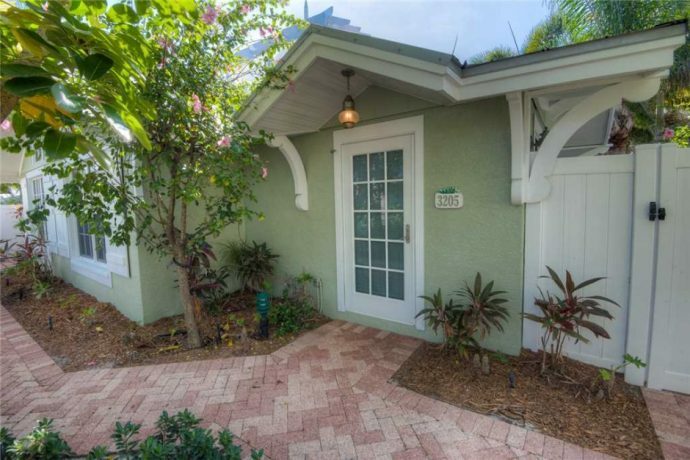 Palm Isle Bungalow is located in the Palm Isle Village in Holmes Beach, right next to some of the island’s most popular eateries and shops including Peach’s, the Old Hamburg Schnitzelhaus, Solo’s Pizza and Paradise Bagels. Manatee Public Beach, one of the best beaches on the island in terms of facilities and safety is also just a half mile from the rental and can easily be walked to. Other beach access points are right across the street! This 1 bedroom 1 bath bungalow is truly ideal for a couple with modern amenities, full linen service, a full gourmet kitchen with a breakfast bar, spacious living area with a flat screen TV, and an on-site pool. The tropical themed landscaping outside of this rental is relaxing and invigorating. You and your partner will revel in being able to kick back and spend time at the pool with a drink, soaking up the sun at the nearby beach, trying the area’s popular restaurants, or cooking meals together with locally caught seafood. 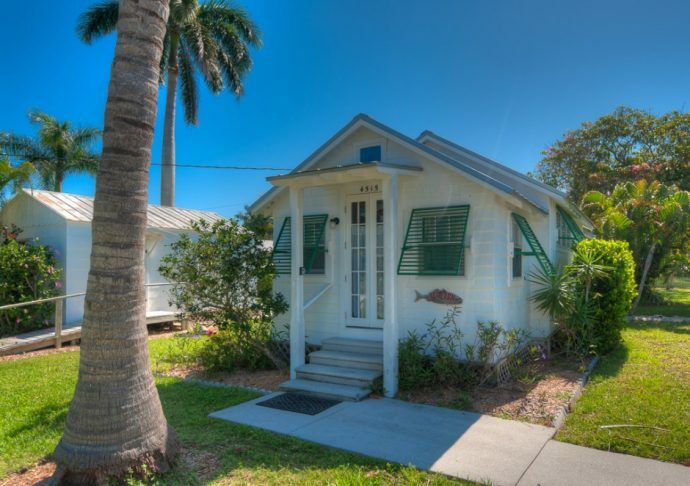 Looking for a charming little cottage to spend your spring vacation on Anna Maria Island? 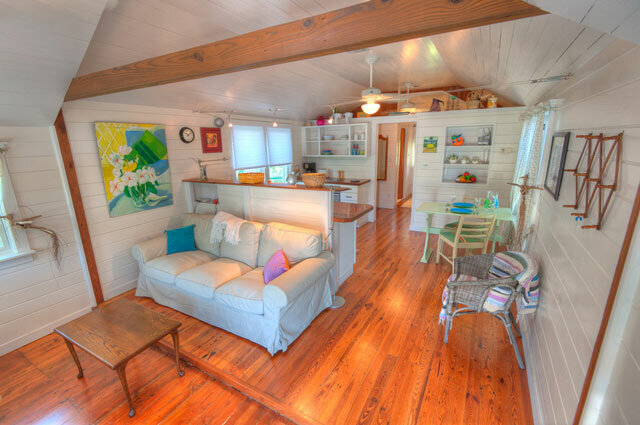 Tuna Cottage might be the one you’re looking for. Located in the fishing village of Cortez, this little one bedroom, one bathroom is nestled away from the busy streets on quiet residential street. You are still just steps away from the ocean while staying at Tuna Cottage, so the incredible views that Anna Maria Island is famous for are available to you anytime you step out of the front door. The Village of Cortez is an ideal place to stay during your romantic getaway, with its historic Old Florida charm. It is a community that truly embraces its history as a fishing hub, and it has resisted the pressure for over-development. Reserving Tuna Cottage will allow you to easily explore this quaint and intriguing village and dine at some of the region’s best seafood restaurants with the freshest local ingredients. Of course, if you prefer to fish yourself, you’ll be able to do so right from your backyard on the shared deep water dock! You can let your worries slip away as you relax on the shared waterfront deck. Watch the ways of the Island from this dock and soak up the sights from across the water overlooking Anna Maria Island. This fantastic unit offers a Queen sized bed, wireless Internet, and a TV and DVD player which you won’t need if your so close to the beautiful Gulf. You can explore the 7-miles stretch of white sand or spend all day in anyone of the surrounding cities. Staying on Anna Maria Island means you have access to it all! 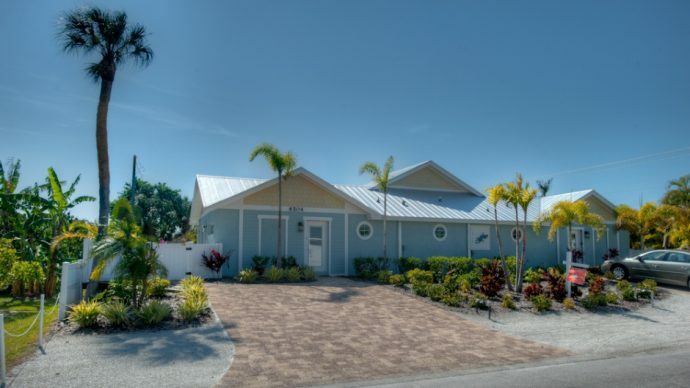 Redfish Cottage is an excellent romantic Anna Maria island vacation rental to consider, as it is absolutely packed with amenities and located in one of the most interesting areas of the island. This cottage offers breathtaking views of the bay as well as a shared waterfront deck on a private and quiet residential street in the historic Village of Cortez. Spend some quality time together outdoors and taking in the gorgeous views with a glass of wine and dinner. The interior features of this cozy cottage include quality hardwood floors, a large comfortable queen sized bed, full kitchen with a refrigerator, coffee maker, and stove and dishwasher. Right outside of your rental you’ll find absolutely stunning scenery and a community grill to prepare meals outside whenever you feel like soaking up some sun while cooking. This is one of the few lodging options where you can get the unique experience of fishing right outside of your cottage and grilling it there as well! Although it’s located in the Village of Cortez, you’ll be able to access everything great that the island has to offer, as the village is directly across the Cortez Bridge which connects to Anna Maria Island. Because it’s slightly off the island, you can get some excellent weekly rates on this rental depending on the time of year you visit. For your own little piece of paradise on your next adventure as a couple, you can’t go wrong with reserving Island Hideaway. 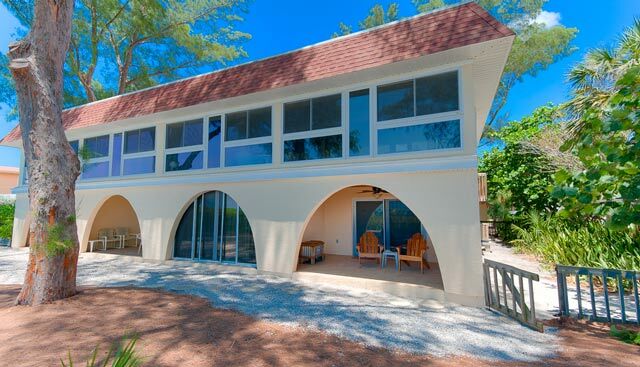 This elegantly decorated Anna Maria Island beach house rental gives you a unique combination of privacy and easy access to all of the best that Anna Maria Island has available. Unwind and delight in features that are better than any luxury hotel including high thread count linens on a King-sized bed, an over-sized walk in shower, flat screen televisions, spacious rooms, and an exquisite kitchen and bathroom with granite countertops and travertine marble. Take a dip in the outdoor pool whenever you’re looking to cool off or walk to the beach which is just two minutes away! The outdoor area has comfortable pool furniture and a grill for cooking while enjoying the sun. Walk to nearby restaurants or take the free trolley which has multiple stops nearby. Take a quick look at the photos of this clean, stylish and contemporary rental to see why it’s one of our top romantic Anna Maria island vacation rentals! 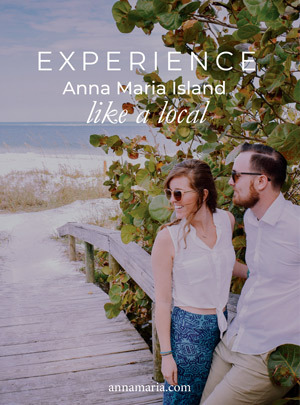 Experience the fun, charm and excitement of Anna Maria Island as a couple and book one of these affordable, conveniently located and amenity-loaded Anna Maria Island romantic beach house rentals today! They are often in high demand during our busiest seasons, and the earlier that you reserve them the more money you will save. You can get immediate prices for any of these wonderful 1 bedroom Anna Maria island vacation rentals directly on our website by clicking any of the listings and selecting your upcoming travel dates on the calendar. You may also contact us at (800)-737-9855 to get prices and reserve your rental on the phone!